Term 4 starting 14 November 2018. A 2018 field trip. At the end of 2018 go to a place that has fascinated explorers and scientists for over 100 years; Antarctica. Unlike early adventurers you won't be sailing there. You will fly on a C17 Globemaster landing on glacial ice with an air temperature of about -20°C. Your first steps will fill your senses to overflowing: eyes will struggle to adapt to the bright light; your boots will make squeaking sounds as you walk; you'll feel a strange sensation as your nose gets cold; judging distances is impossible with nothing man-made for scale. When explorer James Ross sailed into the Ross Sea in 1841, he expected to find a frozen desert. He didn't expect to see seals, whales, fish, penguins and sea birds. How could this be? Where did these creatures find their food? There was no sign of plant life. On this trip you will join a New Zealand science team investigating plant life that supports the Antarctic ecosystem. These plants live within the sea ice. What effect will climate change have on these plants and the sea ice? What will that mean for the animals that depend on sea ice plants? Your friends on this trip are Antarctic scientists and other experts. You will all be staying together at New Zealand's Scott Base. You will join them for meals in the Scott Base dining room. You will sit in on morning meetings to plan the day's activity. You will complete a survival training course before going out in the field. Then you will travel across the ice to do some cool science. We'll look after the RAMS forms - all you need to do is enrol your class! This will be the 14th LEARNZ field trip to Antarctica. The opportunities for student involvement and interaction during this trip will ensure their learning is very real. Go to more comments about Antarctic field trips. The 2018 LEARNZ Antarctica field trip. Why Antarctica? Antarctica has been a place for science research for over 100 years. Antarctica is much studied because of its harsh environment and its major affect on world oceans and weather patterns. It takes 5 hours to fly from Christchurch to Antarctica aboard a C17 Globemaster aircraft. 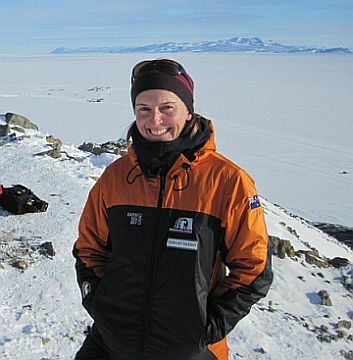 Through Antarctic Field Training and living at Scott Base you can investigate how people working in Antarctica stay safe, maintain personal well-being and relationships with other people, and take responsibility for reducing their impact upon the environment. After Antarctic Field Skills Training you will be experienced and ready to join groups at Scott Base (2km from McMurdo station) in the Ross Sea region of Antarctica. Temperatures in Antarctica in October/November can be as low as -40°C. You will need to be very well prepared.